Researchers have identified a single-site, visible-light-activated catalyst that is capable of converting carbon dioxide (CO2) gas into “building block” molecules that can possibly be used for producing useful chemicals. This latest breakthrough presents new opportunities for using sunlight to convert a greenhouse gas like CO2 into hydrocarbon fuels. 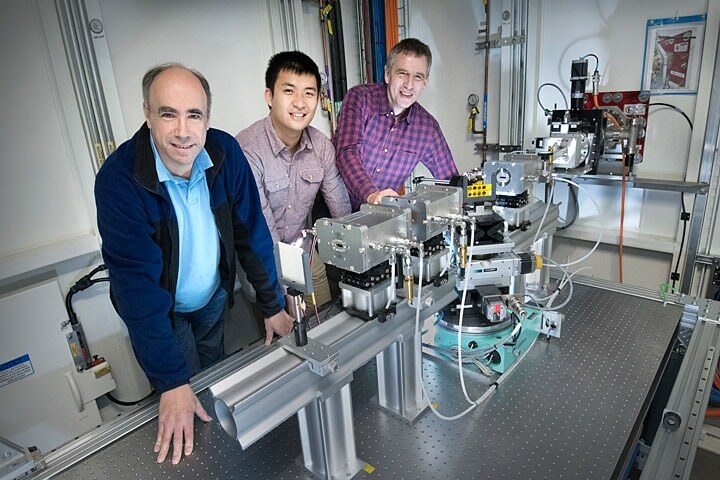 To expose the details of the efficient reaction, the researchers used the National Synchrotron Light Source II, a U.S. Department of Energy (DOE) Office of Science user facility at Brookhaven National Laboratory. This reaction used one cobalt ion to help reduce the energy barrier and break down CO2. The team has illustrated this single-site catalyst in a paper recently reported in the Journal of the American Chemical Society. The conversion of CO2 into simpler parts—that is, oxygen and carbon monoxide—has useful real-world applications. By breaking CO2, we can kill two birds with one stone—remove CO2 from the atmosphere and make building blocks for making fuel. Anatoly Frenkel, Chemist, Brookhaven National Laboratory and Stony Brook University. Frenkel headed the study to gain a better understanding of the activity of the catalyst, which was developed by physical chemist Gonghu Li at the University of New Hampshire. It takes a long time and plenty of energy to break the bonds holding CO2 together. Therefore, Li set out to create a catalyst to reduce the energy barrier and accelerate the process. “The question is, between several possible catalysts, which are efficient and practical to implement in industry?” Frenkel said. Electron supply is a major ingredient needed to break the CO2 bonds, and these electrons can be produced when a semiconductor material gets activated by light energy. It is this light that “kicks” the electrons out and makes them available to the catalyst for the chemical reactions to occur. A natural source of this light could be sunlight. However, ultraviolet light, which constitutes less than 5% of the solar spectrum, alone can activate many semiconductors. “The challenge is to find another semiconductor material where the energy of natural sunlight will make a perfect match to kick out the electrons,” stated Frenkel. The researchers also wanted the semiconductor to adhere to a catalyst produced from materials that could exist abundantly in nature, instead of the rare and costly metals like platinum. In addition, the team wanted the catalyst to be sufficiently selective to drive just the reaction that changes CO2 to CO.
“We don’t want the electrons to be used for reactions other than reducing CO2,” said Frenkel. Graphitic carbon nitride (C3N4) is a semiconductor made of hydrogen, carbon, and nitrogen atoms. Cobalt ions bound to this semiconductor were able to satisfy all these needs. There has been significant interest in using C3N4 as a metal-free semiconductor to harvest visible light and drive chemical reactions. Electrons generated by C3N4 under light irradiation have energy high enough to reduce CO2. Such electrons often don’t have lifetimes long enough to allow them to travel to the semiconductor surface for use in chemical reactions. In our study, we adopted a common and effective strategy to build up enough energetic electrons for the catalyst by using a sacrificial electron donor. This strategy allowed us to focus on the catalysis for CO2 reduction. Ultimately, we want to use water molecules as the electron donor for our catalysis. Gonghu Li, Physical Chemist, University of New Hampshire. To make the catalyst, Peipei Huang, a postdoctoral researcher in Li’s laboratory, merely deposited the cobalt ions on a C3N4 material developed from commercially available urea. Then, using a range of techniques in association with Ronald Grimm at Worcester Polytechnic Institute and Christine Caputo at the University of New Hampshire, the researchers extensively studied the developed catalyst. Under visible-light irradiation, this catalyst appeared to work in CO2 reduction. This catalyst did what it was supposed to do—break down CO2 and make CO with very good selectivity in visible light. But the next goal was to see why it worked. If you can understand why it works you can make new and better materials based on those principles. As a result, Li and Frenkel brainstormed experiments that would accurately reveal the catalyst structure. Through structural studies, the researchers can obtain information regarding the number of cobalt atoms present, their location in relation to the nitrogen and carbon atoms, and other properties that can be possibly adjusted by the scientists to further enhance the catalyst. The team eventually turned to the quick X-ray absorption and scattering (QAS) beamline at NSLS-II to apply X-ray absorption spectroscopy, and Frenkel’s student Jiahao Huang was able to collect the data and examine the spectra with the help of lead beamline scientist Steven Ehrlich. In this method, NSLS-II’s X-rays get absorbed by atoms present in the sample, which subsequently discharges electron waves. The spectra demonstrate how these waves of electron interact with the surrounding atoms, akin to the way ripples on a lake surface get disturbed when they come across rocks. To be able to do x-ray absorption spectroscopy (XAS), we need to tune and scan the energy of the x-ray beam hitting the sample. Each element can absorb x-rays at distinct energies, called absorption edges. At the new QAS beamline we can scan the energy of the x-rays across the absorption edge energy of different elements, such as cobalt in this case. We then measure the number of photons absorbed by the sample for each value of the x-ray energy. Steven Ehrlich, Lead Beamline Scientist, QAS, NSLS II, Brookhaven National Laboratory. The study demonstrated that the catalyst that broke down CO2 was made of single cobalt ions enclosed by nitrogen atoms on all sides. “There were no cobalt-cobalt pairs. So, this was evidence that they were in fact single atoms of cobalt dispersed on the surface,” stated Frenkel. “This data also narrows down the possible structural arrangements, which provides information for theorists to fully evaluate and understand the reactions,” added Frenkel. According to Frenkel, even though the science illustrated in the paper is yet to be applied in practical applications, many possibilities exist for applications. In the coming days, single-site catalysts like these can possibly be applied in large-scale areas with plenty of sunlight to break down surplus atmospheric CO2, just like the way CO2 is broken down by plants and reused by them to create blocks to build sugars in the photosynthesis process. However, rather than making sugars, investigators may apply the CO building blocks to produce useful chemicals or synthetic fuels. The study was funded by the DOE Office of Science and partly by the National Science Foundation.